Battle of Britain; sea preserves a rare “Flying Pencil”…. 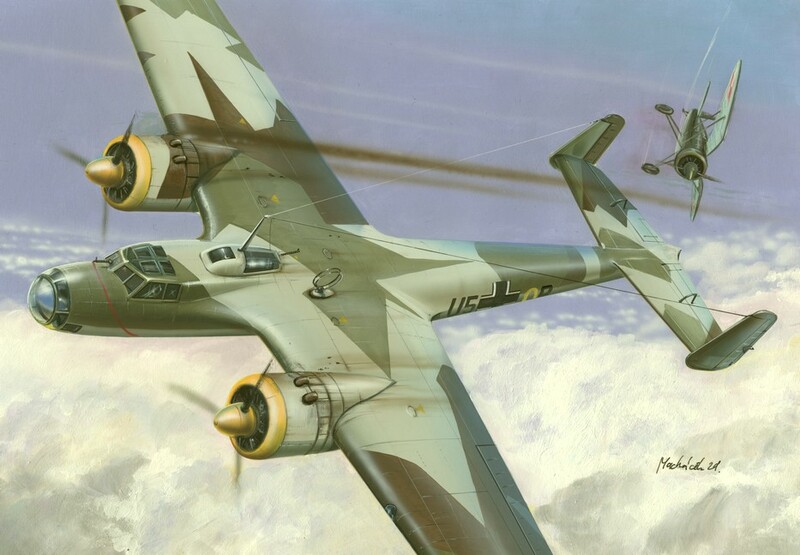 Those who have watched the movie, Battle of Britain may also have seen Dornier 17 in action. Also named as Fliegender Bleistift (German: “flying pencil”), it was a WWII light bomber used by Germany in the Battle of Britain of 1940. This is a rare World War Two German bomber, shot down over the English Channel in 1940 and hidden for years by shifting sands at the bottom of the sea, is so well-preserved a British museum wants to raise it. According to media reports, the Dornier 17 — thought to be world’s last known example — was hit as it took part in the Battle of Britain. It ditched in the sea just off the Kent coast, southeast England, in an area known as the Goodwin Sands. The plane came to rest upside-down in 50 feet of water and has become partially visible from time to time as the sands retreated before being buried again. Now a high-tech sonar survey undertaken by the Port of London Authority (PLA) has revealed the aircraft to be in a startling state of preservation. Ian Thirsk, from the RAF Museum at Hendon in London, told the BBC he was “incredulous” when he first heard of its existence and potential preservation. “This aircraft is a unique aeroplane and it’s linked to an iconic event in British history, so its importance cannot be over-emphasized, nationally and internationally,” he said. Known as “the flying pencil,” the Dornier 17 was designed as a passenger plane in 1934 and was later converted for military use as a fast bomber, difficult to hit and theoretically able to outpace enemy fighter aircraft. In all, some 1,700 were produced but they struggled in the war with a limited range and bomb load capability and many were scrapped afterwards. Striking high-resolution images appear to show that the Goodwin Sands plane suffered only minor damage, to its forward cockpit and observation windows, on impact. “The bomb bay doors were open, suggesting the crew jettisoned their cargo,” said PLA spokesman Martin Garside. Two of the crew members died on impact, while two others, including the pilot, were taken prisoner and survived the war. “The fact that it was almost entirely made of aluminum and produced in one piece may have contributed to its preservation,” Garside told Reuters. The plane is still vulnerable to the area’s notorious shifting sands and has become the target of recreational divers hoping to salvage souvenirs. The RAF museum has launched an appeal to raise funds for the lifting operation. BRIC finally sees its political opportunity in Libya intervention…. Normally, loose economic blocs do not assert their political clout in matters which are handled by UN or the group of five established powers. 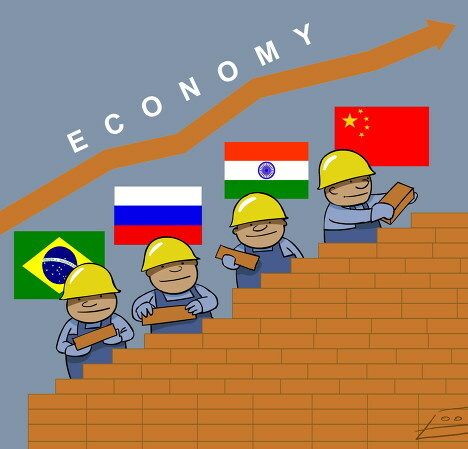 But it now seems that BRIC which refers to the countries of Brazil, Russia, India and China, (South Africa will join soon) which are all deemed to be at a similar stage of newly advanced economic development, has decided to come out of just economic closet and start talking politics. They see their opportunity to assert themselves in the Libya intervention of the West, which they have dared to criticize. According to a paper published in 2005, Mexico and South Korea were the only other countries comparable to the BRICs, but their economies were excluded initially because they were considered already more developed, as they were already members of the OECD. BRIC countries are developing rapidly and by 2050 their combined economies could eclipse the combined economies of the current richest countries of the world. These four countries, combined, currently account for more than a quarter of the world’s land area, more than 40% of the world’s population, and hold a combined GDP (PPP) of 18.486 trillion dollars. On almost every scale, they would be the largest entity on the global stage. These four countries are among the biggest and fastest growing emerging markets. BRICs could not organize themselves into an economic bloc, or a formal trading association, as the European Union has done. However, there are some indications that the “four BRIC countries have been seeking to form a ‘political club’ or ‘alliance'”, and thereby converting “their growing economic power into greater geopolitical clout”. These are not a political alliance (such as the European Union) or any formal trading association, like ASEAN. Nevertheless, they have taken steps to increase their political cooperation, mainly as a way of influencing the United States position on major trade accords, or, through the implicit threat of political cooperation, as a way of extracting political concessions from the United States, such as the proposed nuclear cooperation with India. And they have demonstrated their political ambitions in their abstention failing to support UN Security Council Resolution 1973 which raises serious questions about the future functionality of the multilateral system – a system in which the BRIC countries aspire to have a stronger voice. Effectively, the BRICs sent a message of opposition to allied intervention in countries experiencing fundamental political change. Their vote was an implicit acknowledgement that such collective action often has unintended consequences, and that it can result in one side being given an undue advantage over another. But a less obvious driver for their position is also the notion that one day such a vote could be cast against one of them. It is premature to conclude, says a report in Foreign Policy Journal that the collective opposition of the BRIC countries to allied intervention in Libya represents a formal coalition between these countries. While China and Russia have used their Security Council veto with frequency, aspiring permanent Security Council members Brazil, India, and South Africa are still finding their footing on the global stage, appear hesitant to blatantly oppose the collective will of the established five power permanent members of the Security Council. What they share is a long-held mistrust of Western-led military action and a more general stance in favor of non-intervention. One of the major criticisms of the West’s decision to intervene in Libya by these countries has been the perceived hypocrisy of ‘selective intervention’. One will find it quite interesting that India, together with other three countries of the bloc has found it expedient to criticize West’s intervention in Libya even though it also has a history of armed intervention in erstwhile East Pakistan. The Maldives and Sri Lanka have all experienced intervention by Indian military forces. Likewise, South Africa, the soon to be “S” in the “BRICS” has intervened numerous times in its post-independence history, most prominently in the Angolan civil war in 1975/6 and in the post-Apartheid era, and participated in multilateral intervention in Lesotho in 1998. After vocally supporting the principle of non-intervention, it eventually voted in favor of allied action in Libya. The escalation of the Libyan conflict has surely prompted some of the BRICS countries to contemplate what is involved in having a seat at the world’s top table. The Libyan case further highlights the limitations of a global order struggling to reconcile principles of national sovereignty with principles of multilateralism. The modern history of the world has shown that there will always be crises that require multilateral action. The question has become when the BRICS will be willing to step up to the plate and place idealism above self-interest – an admittedly lofty ambition for any nation-state. Not that the U.S. and European nations have a pristine record in that regard, but they certainly do have substantial economic interests in Libya. The difference is that they have proven willing to sacrifice that interest to participate in sometimes distasteful and necessary political decisions. When was the last time the BRICS countries did that? After Salman Taseer, another high-profile critic of Blasphemy Law meets his fate…. General Zia-ul-Haq, the most condemned military dictator of Pakistan’s history, had no idea that his amendment in the anti-blasphemy law will assume the status of a “divine law” within decades of his death. This amendment was made to please the clergy which was one of the sources of his strength and legitimacy and which he strengthened at the cost of the country. This was a man-made law by every definition and there were dissenting voices demanding to rewrite the procedure in order to minimize the chances of its misuse for personal reasons. However, with the spread of extremism in the country, any move to revise the procedure was deemed to be blasphemy itself. The first high-profile victim was Punjab’s governor Salman Taseer who was killed by his own bodyguard for seeking justice for a Christian convict under the law. Just after two months of now forgotten tragedy, Pakistan’s minister for religious minorities, who had opposed the blasphemy laws, was shot dead in Islamabad on Wednesday. 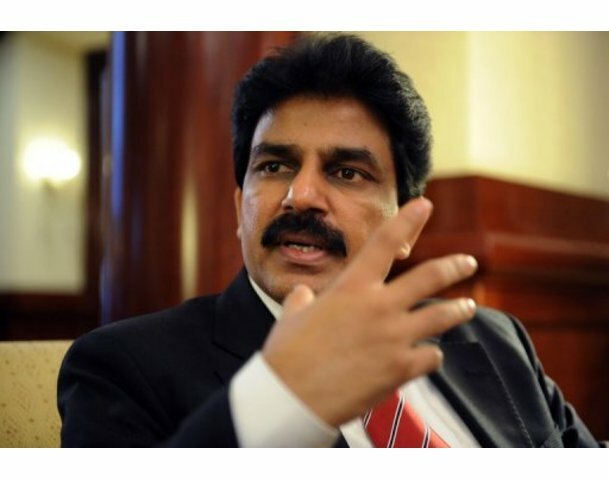 Shahbaz Bhatti, the only Christian member of the cabinet, was thus, the second senior member of the ruling Pakistan People’s party to be gunned down in two months. According to media reports, Tehreek-e-Taliban Pakistan (TTP), has accepted the responsibility for this assassination. The killing was condemned by human rights groups, who say religious extremists are waging a campaign of murder and intimidation to expand their influence and create a climate of fear for minorities. The killing also raises questions about the level of security the state is able to provide to senior officials who might be at risk of attack. The government would investigate why Mr Bhatti did not have greater protection – including a bullet proof car. After Governor Salman Taseer’s assassination, someone like Shehbaz Bhatti, who was such an obvious target, should have had more security. The bodyguard who shot Mr. Taseer said he had killed him for calling for changes to the country’s blasphemy laws. Human rights groups say the laws enshrine discrimination and render minorities second class citizens. An outpouring of popular sympathy for the Mr Taseer’s killer showed how tolerance of pluralism is shrinking in once moderate Pakistan as liberal politicians have increasingly ceded ground to religious hardliners. Mr. Taseer had championed the case of a Christian woman who had been condemned to death under the blasphemy laws. What is more disturbing in Salman Taseer murder, crime or its glorification? Blasphemy law is responsible for extremism, says known Islamic scholar…. Old enemy comes to rescue the US…. It was USSR which had humiliated defeat at the hands of Afghan Mujahideen leading to its break-up. These Afghans were aided and supported by Pakistan and the US. In effect, USSR was fighting USA in Afghanistan. But as they say there is no permanent enemies and no permanent friends in international relations. 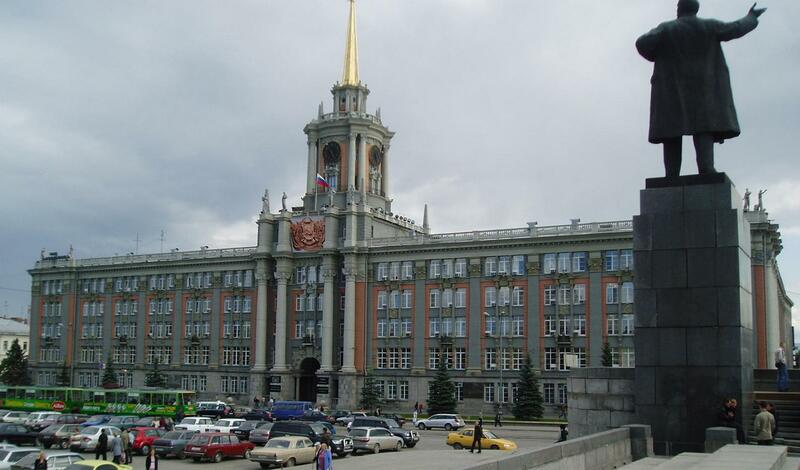 The validity of this statement has been proved by Russia, the successor of the former USSR. Russia has come to rescue the US in its predicament of having a risky supply route to its forces in Afghanistan. According to The Moscow Times, Russia’s State Duma ratified an agreement Friday to allow the United States to ferry troops and supplies across Russian territory for military operations in Afghanistan. The U.S.-Russian transit agreement was drawn up during a trip by U.S. President Barack Obama to Moscow in 2009 in an effort to “reset” relations that had been damaged by a 2008 war between Russia and Georgia. Currently, about 80 percent of NATO’s supplies cross through Pakistan. But NATO has been trying to reduce its dependence on convoy routes through Pakistan, where they are prey to Islamist militant attacks. Deputy Foreign Minister Sergei Ryabkov told the Duma on Friday that there have been 780 U.S. flights over Russia — carrying 115,000 U.S. troops and more than 19,000 metric tons of cargo to and from Afghanistan — since September 2009. Ryabkov said the air route has accounted for 16 percent of all U.S. military shipments to and from the country. He said the agreement has helped improve ties with the United States and NATO and protects Russia’s interests in other areas. Moscow said last year that the deal could also be expanded to allow vehicles in need of repair and refurbishment to be sent back to NATO countries. But the transit deal stops short of opening the Russian route for weapons for the NATO mission in Afghanistan, where Moscow fought a disastrous 1979-89 war that killed 15,000 Soviet troops. Russia has struck similar deals with Germany, France and Spain and has touted them as a key contribution to international efforts to stabilize Afghanistan. Middle East turmoil will not spare the rich economies…. Upheaval in the Middle East is spreading and no one knows where it will stop. But everyone is clear about one thing; it will definitely spread into the rich industrialized world. It may stop somewhere in Europe because American continent is still out of reach. The turmoil in the Arab world is going to trigger worst-ever economic crisis for the world. And it is all about oil which, through still flows from Middle East, is getting dearer in the international market with worsening of crisis in North Africa and Arabian Peninsula. The focus of news after Egypt and Tunis is on Libya, Bahrain and Iran and by implication of Saudi Arabia. Libya is one of Africa’s largest holders of crude oil reserves, Algeria and Iran are major suppliers and Bahrain and Yemen both border Saudi Arabia on the peninsula that produces much of the world’s oil. Together, Libya, Algeria, Yemen, Bahrain and Iran represent about 10 percent of global oil production. According to a report in The New York Times, oil markets are famously skittish, especially when there is even the possibility of disruptions in the Middle East and North Africa, which account for some 35 percent of the world’s oil production and a greater percentage of the world’s known reserves. That nervousness is likely to spread elsewhere, with so many economies still fragile in the wake of the worldwide economic downturn and with the possibility that higher crude prices could lead to further increases in food prices. The high cost of food has already led to unrest in several countries, even before political revolts began in the Middle East. The increased price of energy is a “burden that can be a detriment to the global economic recovery. Brent is a global benchmark crude oil that is produced in the North Sea and traded in London. 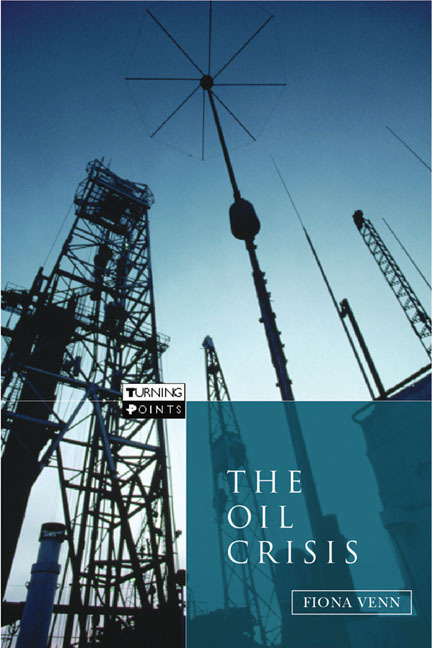 It is typically the benchmark that is used to set the price for most of the oil from the Middle East. Another benchmark crude, West Texas Intermediate, closed at $86.20 a barrel on Friday. Each benchmark has an impact on gasoline prices in the United States, with the East Coast more affected by the Brent prices than other regions. The reserves in the Middle East and North Africa (known as the MENA countries), while long important, have grown even more critical as demand for oil increases. Prices have risen about 30 percent since September, reaching their highest level since September 2008. Those who track oil prices are especially worried about the renewed turmoil in Iran and the possibility of unrest spreading from Bahrain to Saudi Arabia, which could have a major impact on oil’s price and its availability. Richard H. Jones, the energy agency’s deputy executive director and a former American diplomat in the Middle East, said that about 17 million barrels of oil passed through the Persian Gulf and the Strait of Hormuz every day. “So if that shuts down, we’re in big trouble,” he said. But so far, Mr. Jones said, the effects of the regional turmoil have been small. Egyptian production and transportation of natural gas have continued despite an explosion at a pipeline in the Sinai as the demonstrations against President Hosni Mubarak were under way. (An Egyptian investigator said four gunmen bombed the pipeline.) Although there have been labor protests among workers at the Suez Canal, so far analysts have said there is no danger of the vital waterway being affected by the country’s political upheaval. What is kosher in Egypt is forbidden for Iranians…. The wave of popular revolts has not stopped at Suez, it is spreading like bushfire. And the next destination of this fast-spreading upheaval ironically is again the place widely considered as an American base. Bahrain which hosts the U.S. Navy’s Fifth Fleet patrolling the Gulf, is next in line after Tunis and Egypt. According to The Wall Street Journal, this revolt is the first to pit a Shiite Muslim majority against Sunni rulers—heightening the dilemma for the U.S. as it struggles to pursue its interests in the region. The developments came as security forces in Yemen, an important ally in U.S. antiterrorism efforts, fought back protesters for a fifth day. In Iran, the government threatened leaders of Monday’s protests there with execution and made a fresh wave of arrests. The parallel protests against key allies and enemies of the U.S. sharpened the difficulty for the Obama administration, as fast-moving uprisings have unseated regimes in Tunisia and Egypt and triggered opposition rallies in Algeria, Jordan and elsewhere. The president and Secretary of State Hillary Clinton both offered encouragement to Iranian protesters and aimed tough words at Tehran on Tuesday, in marked contrast to their relative silence on Iran during the last wave of protests in Iran in 2009. Mr. Obama praised the courage of protesters and said the Iranian regime was “pretending” to celebrate Egypt’s revolt while “gunning down and beating people who were trying to express themselves peacefully” at home. But anti-US Iran is also not immune to violent protests where protests started again despite government’s use of “iron hand” to suppress the previous post-election demonstrations of 2009. This time, dozens of protesters were arrested for participating in the banned rally, an opposition Web site reported. 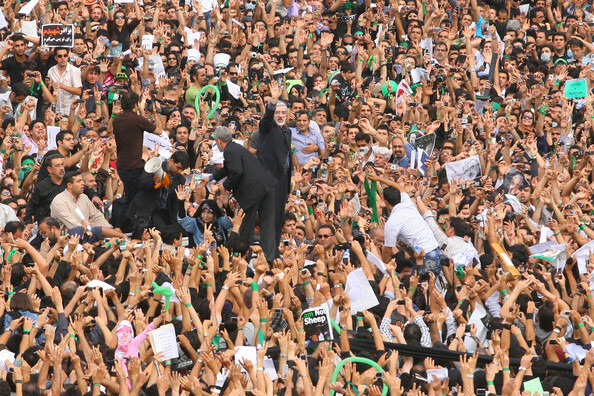 A similar demonstration, clashes and arrests were reported in the central Iranian city of Isfahan. The gathering in Tehran appeared to be the most significant anti-government protest here since security forces cracked down on a series of massive demonstrations in 2009. The size of the crowd was difficult to estimate. Some witnesses said they believed it exceeded 200,000. The Associated Press said tens of thousands of people demonstrated. The government which had been admiring Egyptian protests, has declared Iranians’ protests as illegal and threatened with severe punishments for violators. According to a news report, Bahrain is a tiny, island kingdom in the oil-rich Gulf best known for its banking prowess, along with bars that cater to nationals from alcohol-free Saudi Arabia next door. It pumps little crude itself, but the protests here have brought home to neighboring oil-rich capitals—Dubai, Abu Dhabi, Doha and Riyadh—a taste of the turmoil that had largely been limited to much poorer corners of the Arab world. It’s also the first country experiencing the recent unrest in which the often-explosive sectarian divide between Sunni and Shiite Muslims has emerged in a meaningful way. Shiites make up small minorities in other recent hot spots, including Egypt, Jordan and Yemen, but religious tensions haven’t been a driving factor in unrest in those places. A sustained Shiite uprising in Bahrain would alarm Sunni rulers in Saudi Arabia, Kuwait and the United Arab Emirates, all Gulf countries with sizable Shiite minorities. They worry about the unrest spilling across their borders, and the possibility Iran would have more opportunities to meddle in the region. Gulf rulers are often quick to blame Iran for instigating trouble among Shiite populations, though real Iranian influence in those communities has been limited. Some U.S. officials believe if the current government fell in Yemen, U.S. operations in the country could be hamstrung. Those operations include training commandos and conducting counter-terrorism strikes. Yemen is the home to al Qaeda in the Arabian Peninsula, and officials say a collapse of the weak government could give the group free rein. Likewise, the Obama administration fears unrest in Bahrain could undercut U.S. interests in a region where a significant chunk of the world’s oil is produced and transported each day. Although it lacks oil, Bahrain’s housing of the U.S. Navy’s Fifth Fleet make it a critical port for the Navy vessels deployed to counter Iran and protect the Persian Gulf. If Bahrain’s Sunni-led government were to be forced from power—something protesters haven’t yet made a focus of their demands—some fear a new government might seek closer ties to Iran and force the U.S. Navy to relocate. Another concern is that an uprising in Bahrain could spill into next-door Saudi Arabia or Kuwait, where even minor unrest might roil world-wide oil markets. Retirement frightens everyone, even the most powerful dictators like Hosni…. Finally, full dress rehearsals of the script on Egypt have started taking place. Mubarak’s possible replacement, the very same gentleman used for finding WMD and giving reasons to the US to occupy Iraq has already been shipped to Cairo. Negotiations are under way to fine-tune the “transition” arrangements. A public message has been sent to Mubarak to step down. It shows that time has run out for the president. But Hosni Mubarak is clinging to power and looking for extension to his rule at least till September which is only half a year away. But it seems that no one is listening to him. He may have to be sent following the footsteps of the Tunisian dictator. Time was when a dictator like Egypt’s Hosni Mubarak, watching his hold on power crumbling in the face of an uprising, had plenty of retirement options. Odds were he could find a quiet life in one of Europe’s posher watering holes: Mougins in the hills above Cannes, on the shores of Lake Geneva, or maybe a smart Belgravia townhouse. He generally had plenty of cash parked outside the country and often would take a last dip in the treasury on the way out the door. To be sure, he had to keep his wits about him to avoid anarchists and assassins, and he had to avoid too much obvious meddling in his homeland’s politics lest this jeopardize his host’s grant of asylum. But he could usually look forward to a peaceful and comfortable run for his waning days. So why is Mubarak trying to squeeze a few more months out of his three-decade career in office and avowing his intentions to stay in Egypt rather than packing for the Riviera? According to an article in Foreign Policy Magazine, it may be because exile isn’t what it used to be; over the last 30 years, things have gotten increasingly difficult for dictators in flight. Successor regimes launch criminal probes; major efforts are mounted to identify assets that may have been stripped or looted by the autocrat, or more commonly, members of his immediate family. I witnessed this process myself, twice being asked by newly installed governments in Central Eurasia to advise them on asset recovery measures focusing on the deposed former leader and his family. More menacingly, human rights lawyers and international prosecutors may take a close look at the tools the deposed dictator used to stay in power: Did he torture? Did he authorize the shooting of adversaries? Did he cause his enemies to “disappear”? Was there a mass crackdown that resulted in dozens or hundreds of deaths? A trip to The Hague or another tribunal might be in his future. Slobodan Milosevic, who died while on trial there, and Charles Taylor, whose prosecution there is expected to wind up later this month, furnish examples that any decamping dictator would need to keep in mind. There’s no doubt that the endgame for Mubarak involves many of these concerns and backroom machinations. So, how can Mubarak protect himself if he eventually makes an escape from Cairo? He’s taking the usual steps now. Start with his decision to install foreign intelligence chief and CIA confidant Omar Suleiman as vice president and constitutional successor. 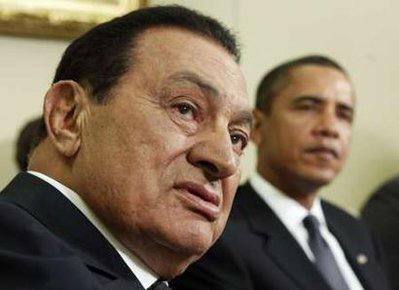 (Mubarak himself came to the presidency through this route; he had been Anwar Sadat’s vice president.) This comes close to matching what in the Russian-speaking world is known as the “Putin option,” a reference to the exit strategy adopted by a teetering Boris Yeltsin: Fearing possible retribution from opposition figures, Yeltsin opted to surrender power through a transitional period to a wily senior player in the intelligence community. In exchange, Yeltsin is said to have extracted a firm commitment from Putin that the full machinery of the Russian state would be mustered to protect him. There would be no criminal probes or inquiries, and no cooperation with foreigners who undertook the same. Yeltsin would be free to live his final days shuttling between Moscow and the French Riviera. Putin scrupulously kept his end of the bargain. Is Uncle Sam fanning the flames of unrest in Egypt? Your cousins-in-faith can teach you to survive discrimination in the West…. Major sufferers in the post 9/11 America are Muslims because those involved in the tragedy were all said to be Muslims. And now Muslims as a community have to bear the brunt for a crime committed by criminals. America is a continent inhibited by immigrants and immigrants are never welcome in their adopted homeland. 9/11 only complicated the problem and now every Muslim is looked at with suspicion. And those looking at them with suspicion have a genuine reason to do so. They are simple and can easily be made to believe that all Muslims are terrorists and that it is the Muslims who are trying to destroy the American society. This is not new to the Muslims though this Islamophobia may have been a little more intense. Muslims’ cousins-in-faith, the Jews also had to undergo similar hostile treatment but they very successfully assimilated themselves in the American society. If the Muslims want to continue to keep the USA as their homeland, they need to learn from Jews and try to assimilate. If they find it difficult to do, they have an option to come back to their countries of origin any time. Express Tribune in a recent blog says that Muslims in America have to start taking the route of our Jewish brothers and sisters, and they need the help of the latter to make it happen. In fact, this suggestion comes from acclaimed American Muslim author, academic and Harvard Divinity School graduate Reza Aslan. He was speaking at Columbia University. Last November, two of Columbia’s largest student organizations, Hillel and the Muslim Students Association, came together to jointly host the event “Re-evaluating Park 51: Islamophobia and Anti-Semitism”. The event was held in recognition of the negative and oft-times bordering malicious (read Fox News) coverage of the Muslim YMCA-like community center ‘Park-51’, a few blocks from (but not at) Ground Zero. Professor Aslan was called in to link the persecution of Jewish immigrants to the US in the late 19th and early 20th centuries and its resonance with the defamation of Islam and Muslims in America today. The Jews who immigrated to the US were faced with persecution and discrimination from all sections of America. From politicians to business tycoons like Henry Ford – many people, like the family of my friend Raphael Pope-Sossman, had their last name changed and Christianized (hence the aptly named “Pope”) to escape. Catholic immigrants were another minority that faced similar discrimination. When Kennedy was running for President, he was slandered on two accounts, for not wearing the hat and for having more loyalty to the Pope than the constitution of the United States. While both Catholics and America’s Jewry had to work very hard to achieve it, with time both these minorities were able to embed themselves well in the American state and society. In the early 20th century for instance, Harvard University President Lawrence Lowell tried to impose quotas on Jewish admissions to the University, and by 2001 Harvard had appointed Larry Summers as its first Jewish President. How should Americans bring to an efficacious end the discrimination against them? There are the usual suspects of working hard, attaining very high degrees of education and setting exemplary personal standards in their lives. After all, Pew surveys show that Americans who know just one Muslim personally have a dramatically less negative view of Islam. But it is the arts that are an all-important prong of changing this discourse. When Harvard Professor Joe Nye coined the phrase “soft power” he meant it in the context of states. However, the concept can easily be used as one for communities, ethnicity or religion based. The arts provide an excellent platform to achieve wide acceptance due to their ability to lift people or entertain them. The creators of Batman and Superman were Jewish, and today there is no 15-year-old (and many 50-year-olds) that has not been at some point obsessed with these superheroes. Similarly when you wear a Ralph Lauren gargantuan Polo shirt, or a pair of Calvin Klein slacks you experience genius designer wear from two designers who happen to be Jewish. It is, therefore, imperative for Muslims to increase their presence in the various fields of the arts. There is much we can learn from our Jewish peers. The label of “anti-Semitism” has become one of the worst kinds of xenophobia one can ever be accused of. The linking of Islamophobia with anti-Semitism is essential to make sure that Machiavelli concoctions of all on-partisan vendetta based elements against Islam can be effectively brought to an end. There is good movement in this direction, and the greatest defender of Park-51 has turned out to be New York’s Jewish mayor Michael Bloomberg, tear-fully pleading for it to be allowed to be built. It is now up to both sides to in the words of Nixon “cease the moment”! Why not appoint Madhuri and Musarrat Shaheen as US envoys to Srinagar and Kabul? According to whistleblower website WikiLeaks, the US had deliberated in detail to soften battle-hardened Taliban through Bollywood actors. Uncle Sam may have thought that given the popularity of Bollywood movies in Afghanistan, these Indian heart-throbs would use their magic to turn Pashtun Taliban into a softened romantic lot who would stop every American soldier on the road to tell him, “I love you”. This idea, however, was not put to any test. If it was, it would miserably flop because Taliban are not cine-goers, and if at all they ever were, they would always prefer Lollywood (read: Musarrat Shaheen) movies over the movies of Madhuri Dixit. It is surprising, however, that the insurgency in Indian-held Kashmir never attracted the attention of Americans like the war in Afghanistan. If it had, they would have thought about sending Madhuri & Co to Srinagar to soften Indian security personnel who vent their anger and frustration on hapless freedom seekers. Srinagar would be an appropriate destination for Madhuri & Co because she and her likes are already popular there through their movies. Kashmir is probably the most repressed land on the face of the planet where freedom struggle, in spite of all kind of atrocities, has refused to subside. The Americans were aware of these atrocities because they were adequately briefed by the ICRC. According to Guardian, US officials had evidence of widespread torture by Indian police and security forces and were secretly briefed by Red Cross staff about the systematic abuse of detainees in Kashmir. The dispatches, obtained by website WikiLeaks, reveal that US diplomats in Delhi were briefed in 2005 by the International Committee of the Red Cross (ICRC) about the use of electrocution, beatings and sexual humiliation against hundreds of detainees. Other cables show that as recently as 2007 American diplomats were concerned about widespread human rights abuses by Indian security forces, who they said relied on torture for confessions. The revelations will be intensely embarrassing for Delhi, which takes pride in its status as the world’s biggest democracy, and come at a time of heightened sensitivity in Kashmir after renewed protests and violence this year. The embassy reported the ICRC concluded that India “condones torture” and that the torture victims were civilians as militants were routinely killed. The ICRC has a long-standing policy of engaging directly with governments and avoiding the media, so the briefing remained secret. An insurgency pitting separatist and Islamist militants – many supported by Pakistan – against security services raged in Kashmir throughout the 1990s and into the early years of this decade. It claimed tens of thousands of lives, including large numbers of civilians who were targeted by both militants and security forces. The ICRC staff told the US diplomats they had made 177 visits to detention centers in Jammu and Kashmir and elsewhere in India between 2002 and 2004, and had met 1,491 detainees. They had been able to interview 1,296 privately. In 852 cases, the detainees reported ill-treatment, the ICRC said. A total of 171 described being beaten and 681 said they had been subjected to one or more of six forms of torture. These included 498 on which electricity had been used, 381 who had been suspended from the ceiling, 294 who had muscles crushed in their legs by prison personnel sitting on a bar placed across their thighs, 181 whose legs had been stretched by being “split 180 degrees”, 234 tortured with water and 302 “sexual” cases, the ICRC were reported to have told the Americans. “Numbers add up to more than 681, as many detainees were subjected to more than one form of IT [ill-treatment],” the cable said. The ICRC said all branches of the Indian security forces used these forms of ill-treatment and torture, adding: “The abuse always takes place in the presence of officers and … detainees were rarely militants (they are routinely killed), but persons connected to or believed to have information about the insurgency”. Ten years ago, the ICRC said there were some 300 detention centres, but there are now “a lot fewer”. The organization had never however gained access to the “Cargo Building”, the most notorious detention centre, in Srinagar.The abuse continued, they said, because “security forces need promotions,” while for militants, “the insurgency has become a business”. US diplomats repeatedly refer to human rights abuses by security and law enforcement agencies within India. In a cable from February 2006, officials reported that “terrorism investigations and court cases tend to rely upon confessions, many of which are obtained under duress if not beatings, threats, or, in some cases, torture”. You have tried, without success, daisy-cutters and Indian army in Afghanistan and Kashmir. 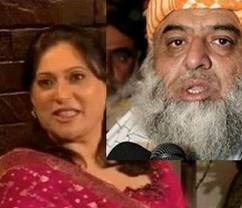 For a change, why not give peace a chance through Musarrat Shaheen and Madhuri in Kabul and Srinagar respectively? Madhuri Dixit melting Taliban hearts….. Imagine Madhuri Dixit and Shahrukh Khan making an appearance in one of the Kabul theatres or the Tora Bora Mountains preaching enlightenment, moderation, non-violence and tolerance and the Taliban suddenly start feeling their hearts melt for American soldiers and Indian road contractors. Don’t throw it away or laugh it off as a weird thought but it did exist at one point in time. The USA seems to have been under the impression that Bollywood heart throbs are so much worshipped in Afghanistan that their presence could make a lot of difference. US diplomats suggested stars of India’s film industry could be sent to Afghanistan to help stabilize the troubled country, according to a leaked cable published Friday. The Express Tribune has reported that the confidential US document from March 2007, released by the whistle-blowing website WikiLeaks, said that high-profile Bollywood actors could play a key role in India’s “soft power” assistance in Afghanistan. “We understand Bollywood movies are wildly popular in Afghanistan, so willing Indian celebrities could be asked to travel to Afghanistan to help bring attention to social issues there,” it said. Bollywood, based in the western city of Mumbai, is a two-billion-dollar industry which has become increasingly popular abroad, not just among the Indian Diaspora but in Pakistan, Afghanistan and Gulf states. In Afghanistan, Bollywood films are regularly shown on television, though with the bare midriffs and plunging necklines of its sari-wearing actresses pixellated for a largely conservative Muslim audience. Movie soundtracks are also popular. The suggestion, which did not come to fruition, was part of a role envisaged for India in what US diplomats called “people-to-people” assistance. Others included “symbolic” exchange programs in areas like sports or business. US diplomats in New Delhi described India as Afghanistan’s “natural ally” and advocated using its vast wealth of well-trained, and cheaper, expertise to build capacity in areas including the civil service and electoral bodies. But it warned that a key obstacle to increasing Indian influence would be Pakistan, which fears being encircled by its larger, powerful neighbor and traditional rival. India has committed $1.3 billion to Afghanistan since the US-led invasion toppled the Taliban regime in late 2001. Thousands of Indians are building roads, sanitation projects and power lines, while India is also building the new Afghan parliament. But India’s involvement has come at a cost, with a number of deadly attacks on its interests in the country, including at its embassy in Kabul.